Charity Ride - getting you to your destination while making the world a better place. I'm always thinking of ways current business models could be adjusted to make a make positive difference in the world. 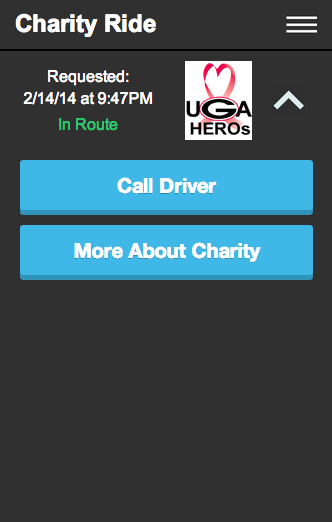 So, why not combine Uber + nonprofit volunteers? 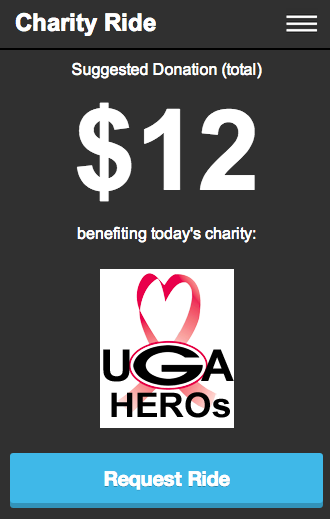 The market would be college towns due to the willingness of college students to volunteer their time and car. Each Friday and Saturday (peak hours) the nonprofit of the day would recruit a couple volunteers to donate their car and serve as 'taxi drivers'. 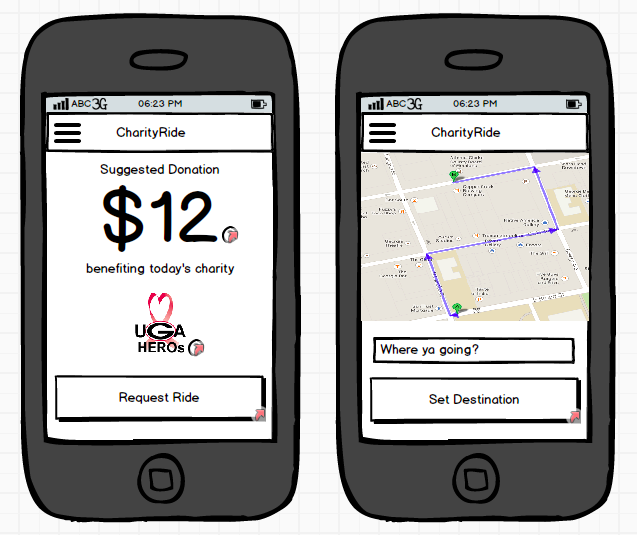 The goal of user research was to discover how college kids request, use, and purchase taxis. 1) Most students interviewed fell between requesting taxis on a semi-regular basis and rarely requesting a taxi. A majority of students that do requests taxis on a semi-regular basis used traditional taxis, with Uber as the second means of transportation. 2) When using a new app students don't feel comfortable entering their credit card information before 'playing around' (experiencing) with the app. 3) Money is key. If there is a cheaper option they will gravitate towards that option. 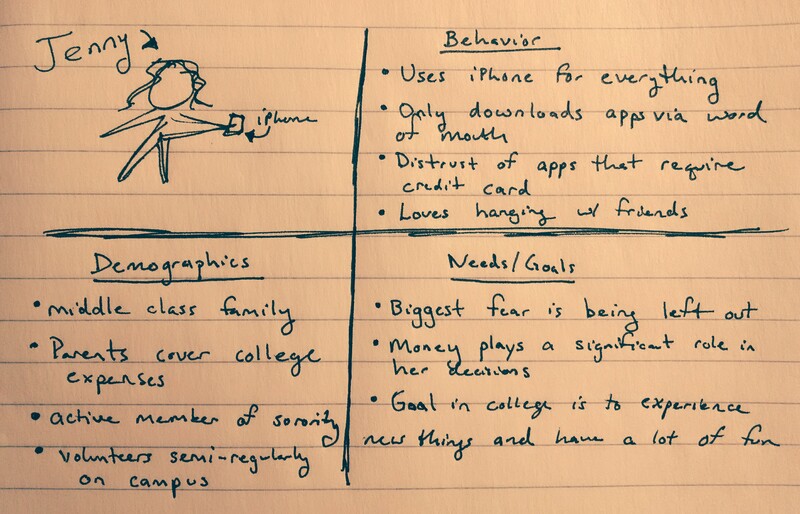 Below is one project persona I developed after user research to fully understand college students behaviors and needs/goals. 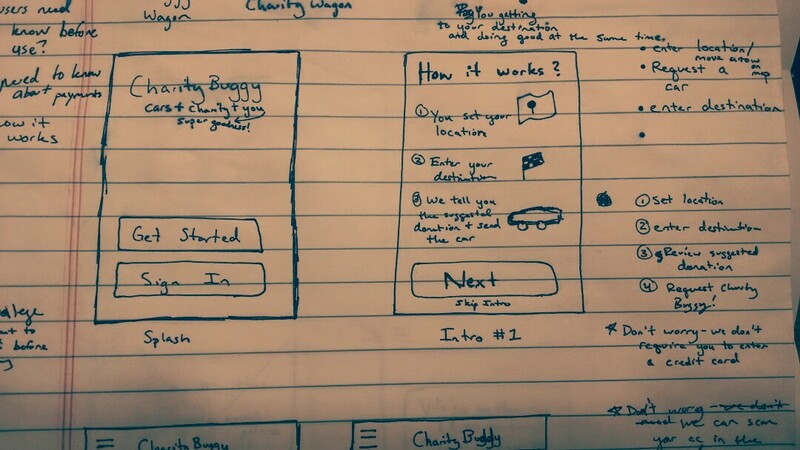 Based on my user research I wanted to focus my concept on simplicity and payment transparency. Gradual Registration: Simplicity means lowering the barrier to engagement with the app. So, I wanted to get the users engage with the app to see the benefits before making them register and confirm an email address. 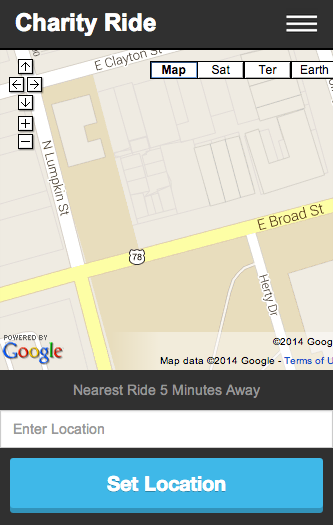 After the user requests the taxi we ask for their phone number (so we can call them as well). We then ask if they would like to create an account. If they choose not to create an account we will maintain the app data associated with the phone number. Payment: As I learned in user research students don't trust a new app with their credit card information. Therefore, we explain in the app walkthrough that credit cards are accepted in the car (along with cash). After engaging with the app they are given the option to create an account where a credit card could be saved. I also wanted to show the cost of transport before the user completed the request. This is key because college students are conservative with money and want to know all costs before purchase. My next step was to test a prototype and validate my hypothesis (design). After mocking up a rough Balsamiq prototype to understand the basic flow, I was able to mock up a HTML/CSS fidelity prototype using Webflow very quickly. During testing multiple users noted the overall flow was simple and easy to use. In addition many users commented that the gradual registration was 'cool' because there was no pressure to sign up or add a credit card to the app. The biggest insight, however, during user testing was confusion around the price (THIS is why user testing is so awesome). In my next iteration I will add a 'more info' button to the payment page that explain how the prices are calculated.